Digital reading programs and leveling for students. An age-old education dilemma has a digital face: Hook students with an easy read, or make them sweat? Digital programs like Newsela are shaking up the familiar world of the leveled reader. The notion of leveling was introduced by psychologist and reading specialist Emmett Betts in 1946. In a book published that year, Betts instructed teachers to select texts that students could read with relative ease, and to avoid assigning “frustration-level texts.” His approach has proved remarkably durable, as the shelves full of leveled-reader series like Step Into Reading and DK Readers in any school library demonstrate. But digital programs like Newsela (the name is a combination of “news” and “ELA,” or English Language Arts) are shaking up the familiar world of the leveled reader. Dan Cogan-Drew, a co-founder of Newsela and its chief product officer, explained in an interview some of the novel features his program brings to leveling. First, new-generation leveling tools like Newsela allow every student to read the same story, albeit at varying levels of complexity. “This facilitates the social learning that happens when students engage in a shared discussion of the text,” Cogan-Drew notes. Second, digital reading programs can make leveling more discreet, preventing students from being teased or stigmatized for reading at lower levels. Compared with the large numbers emblazoned on the covers of many leveled-reader print books, the computerized versions call far less attention to the degree of competency of their users. At the same time, students using these programs are often given the option of dialing up or down their reading level themselves, supporting the development of their “metacognition,” or awareness of their own cognitive abilities. “You might think that kids would always make the stories as easy as possible to read, but that’s not what our data suggests is happening,” says Cogan-Drew, who notes that students often ratchet up their reading levels in pursuit of more detail on an interesting story. 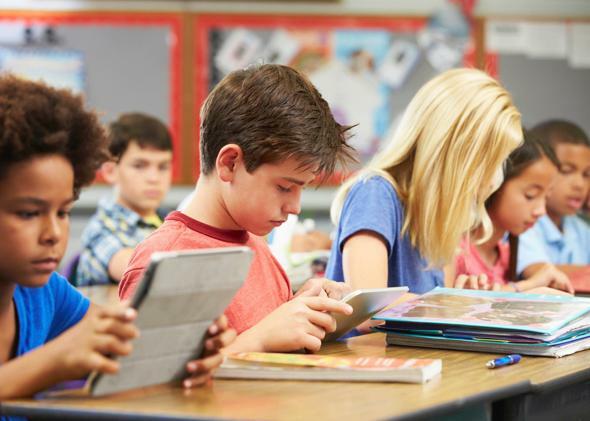 Like other digital reading programs, Newsela uses short online quizzes, taken by students after reading each article, to help evaluate students’ comprehension and adjust their reading levels accordingly. Such “formative assessments” ensure that no student is unfairly labeled by an outdated evaluation—another potential advantage of computerized leveling over its paper-and-ink counterpart, which offers no automated way to monitor students’ increasing fluency. Ironically, these digital improvements on traditional leveled reading arrive just as the practice of leveling itself is coming in for criticism. Commentators like Timothy Shanahan, an emeritus professor of urban education at the University of Illinois at Chicago, and Robert Pondiscio, a senior fellow at the Thomas B. Fordham Institute, an education think tank, have recently argued that leveled reading programs provide students with too little challenge. Better than having each student read at his or her own level, they say, would be asking all students to tackle texts appropriate to their grade level, with teachers supplying help when necessary. The defenders of leveled reading and the champions of complex texts may share more common ground than they realize, however. Both agree that to become fluent readers, students must read a lot on their own—and such independent reading calls for not-too-easy, not-too-hard selections that look a lot like leveled reading. Meanwhile, both sides also concur that students should be asked to wrestle at times with more challenging texts—but in the classroom, where teachers are available to offer help and head off discouragement. This mix of comfort and challenge, along with the exciting possibilities opened by digital reading programs like Newsela, can offer students the best of all worlds: one that’s been made both complex and comprehensible. This story was produced by the Hechinger Report, a nonprofit, nonpartisan education-news outlet affiliated with Teachers College, Columbia University. Future Tense is a partnership of Slate, New America, and Arizona State University.